Russia’s brutal technical death metal band Neurogenic will release their debut EP, Ouroboric Stagnation on September 2nd. You can now stream “Spirited Bloody Emesis” on bandcamp, and it’s very representative of the rest of the album. At exactly 25 minutes of running length, it’s pretty short for an album, but it’s to be expected from that genre. The riffs are interesting and sound unique to that band, the singing consists of, in typical grind fashion, a mix of death growls and pig squeals. The production is a bit harsh, but that’s also a staple of the genre. Overall, it’s a great, filthy album to demolish entire cities to. 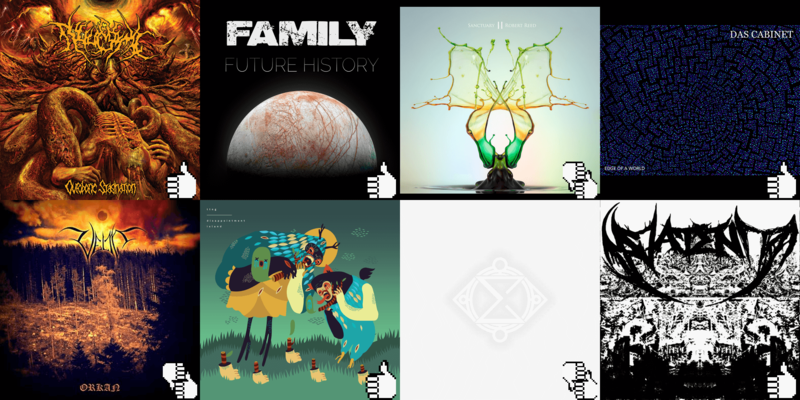 Family‘s debut album, “Portrait”, was – and still is – one of the best metal albums of 2012 for its particular blending of progressive rock, stoner, and metal. With Future History coming out in just a few days, it’s difficult for me to have a neutral approach to it. I expected more of what made Portrait awesome: odd-time signature riffs on overdriven guitars, absurdly heavy harsh vocals, and atmospheric song buildups (like the song “Othermother”), but their new release is not that. It does build upon their previous work, the riffs are characteristically “Family”, but they expand on it: there are clean vocals, about which I’m still unsure, and it seems to me that the odd-time signatures and atmospheric portion of their sound have been toned down a little. It’s but a minute disappointment, however, as I found the album completely enjoyable. It’s a recommendation. Optimistic prog rock is quite rare, these days, but with the advent of Anderstolt – and now Robert Reed‘s Sanctuary II -, we could say it’s Spring time in the prog scene. This album consists of a 40-minute track that’s very reminiscent of The Flower Kings, but with less focus on the “rock”, and more on the “prog”, bringing in multiple influences from world and acoustic music. It’s an interesting concept, musically, but the really noteworthy moments are few and far between. There is a bunch of cool instruments, too, such as banjo, marimba, mandolin, bouzouki, and many others. That being said, I’m hardly a fan of more stripped down music so say what you want about my lukewarmness for this album. Das Cabinet, from Germany, released their third EP, Edge of a World, a few weeks ago, on June 23rd. It’s a pretty cool and dark sounding instrumental progressive metal album. The riffs are great and they use different sounds for many instruments, which breaks the monotony. The album is just short of 30 minutes, so it’s rather long for an EP. The band uses regularly and effortlessly odd-time signatures that emphasize the progressive metal nature of the music. I really recommend you check this one out! Since there is no actual stream of Orkan, here’s their previous album, “Földek”. Velm is an atmospheric black metal band from Hungary, and their thing is that they use synths a lot in their music. They are described as “synth pagan black metal”, so that explains that. I’m probably the last person on Earth that would say pagan metal is good, but this is actually tolerable for some reason. Go figure! Have a listen whenever they publish a single for their new album, and judge by yourselves! Mathies’s favourites TTNG just put out a sweet new album, Disappointment Island. I don’t know what you expected, but it’s pretty much just like Animals and 13.0.0.0.0. The production is a bit quieter on that one, but the musicianship and songcrafting is on par with everything the band has released earlier. While it’s not an evolution of their sound as much as it is a mere continuation, it’s still some delectable tunes that have the added benefit of being radio-friendly (hint: it’s easier to introduce your pleb friends to math music if you make them listen to TTNG first, and not Yowie). Esther is an alternative rock band from the United Kingdom. They have some cool verses, but their choruses are pretty bland and too overtly pop to my tastes. For example, the bass and drums duo in the verses of “As One” are somewhat decent, but it all goes out the window when the pre-chorus and chorus hits. The formula is the same all throughout the five-song EP, with a few exceptions, but nothing too outlandish. The music is pretty and simple, but barely interesting enough. And, finally, some interesting stuff from Montréal’s experimental deathgrind band Patent. With their debut EP, Untitled, they manage to show us where are their boundaries. After the noisy “Prélude”, “La faim” starts with a long, atmospheric, and ominous introduction to the song, which kicks in at about halfway to a slow and tritone-full riff that almost feels like sludge. From there on, the EP keeps getting more aggressive and experimental, which is always a good thing, isn’t it? The only thing obviously missing is a bass guitar, which could bring so much more weight to their compositions. But I’m sure the band is already working on finding a fitting candidate. Hopefully it’s present on their next release! On	July 12 2016, this entry was posted.